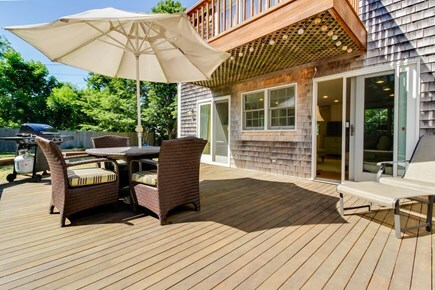 Wake up in one of the most coveted neighborhoods on Martha's Vineyard when you stay at this four-bedroom Edgartown home, a lovely island retreat with a large grassy lawn and deck within walking distance of downtown. 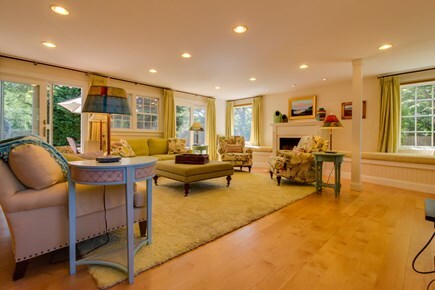 This two-level home is situated on a quiet piece of property just half a mile from the center of Edgartown. 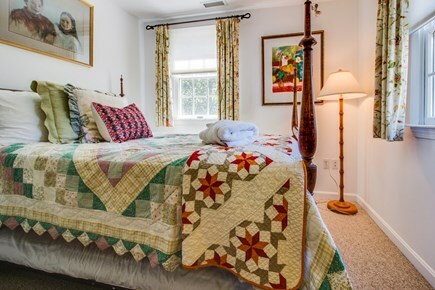 It's also only half a mile from the Chappy Ferry to Chappaquiddick Island, one mile from Lighthouse and Fuller Street Beaches, three miles from Bend-in-the-Road Beach, and four miles from Katama Beach. Walk inside to discover an elegant living space with hardwood floors, sun-lit window seats, and a gas-powered fireplace for cool island evenings. Return home from an afternoon on the beach to use the WiFi to check your email or curl up for a night of Netflix on the flatscreen cable TV. 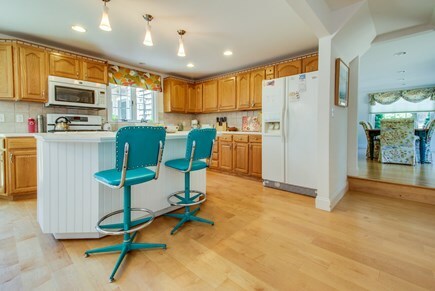 Prepare fresh local seafood in the full kitchen and leave the dishwasher to handle the clean-up. 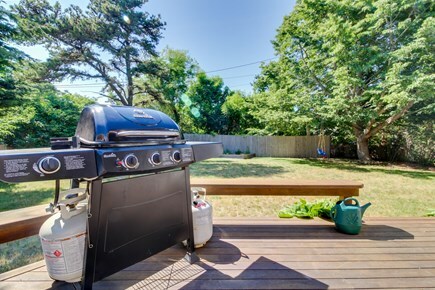 You'll find seating for two at the breakfast bar, plenty of space around the eat-in kitchen table, as well as a gas grill and patio seating on the deck for al fresco lunches and dinners. Kids will spend hours playing in the expansive yard, while parents will love having a private washer/dryer and an outdoor shower to keep the sand and salt at bay. 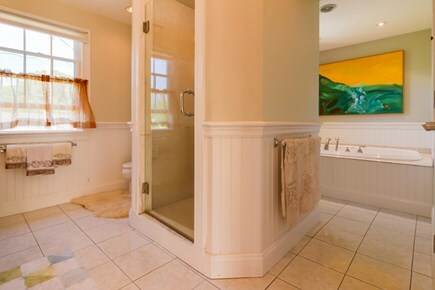 This four-bedroom, three-bathroom home will accommodate as many as eight people. 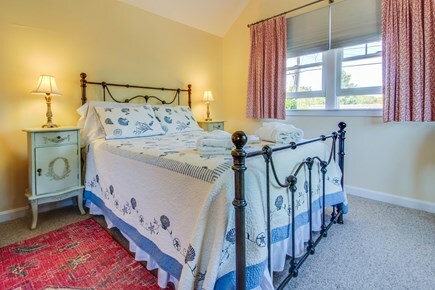 You'll find a queen sleigh bed in the master suite, as well as a sitting area and a bathroom with a jet tub and a stall shower. 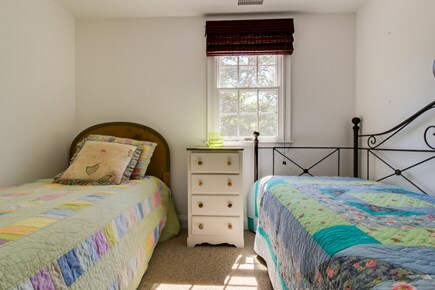 The second and third bedrooms have a queen bed and a set of twin beds, respectively, while the fourth bedroom has a crib and an extra-large double bed (which can fit two people but is more ideal for one). 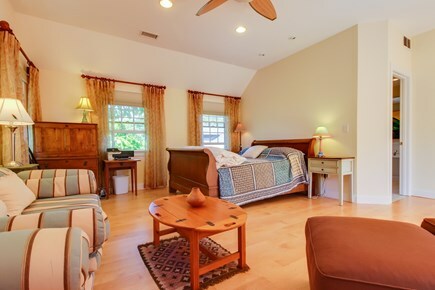 Please be advised, however, that one of the guest rooms is an alcove-style room with a portable divider. An epicenter of New England history and charm, Edgartown is a wonderful destination for beach-goers, island regulars, and first-time visitors alike. Spend your days on the three-mile stretch of sand at Katama Beach, take a short and scenic walk down to Lighthouse Beach, or hop on the Chappy Ferry to explore beautiful East Beach and the Cape Poge Wildlife Refuge. 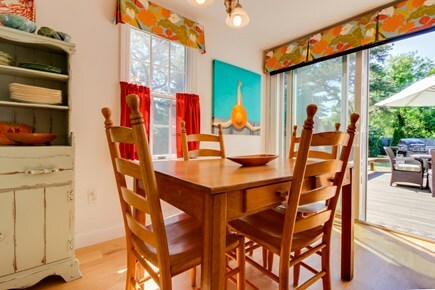 The beauty of Martha's Vineyard will be just outside your door - book this fantastic Edgartown home today! 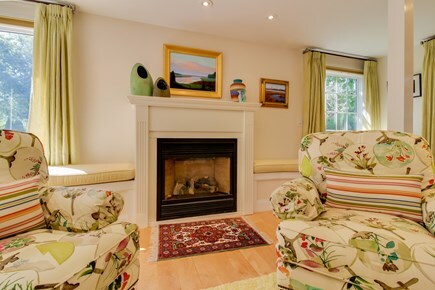 Amazing property within walking distance to town. The house was spacious and had an amazing outdoor space as well. The property manager was extremely helpful. We will definitely be returning! 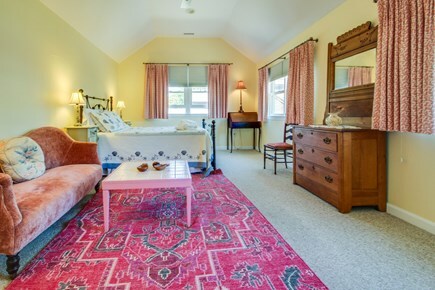 Great accommodations, spacious & beautiful home, 10 min walk to Edgartown Village & harbor. Definitely want to return. 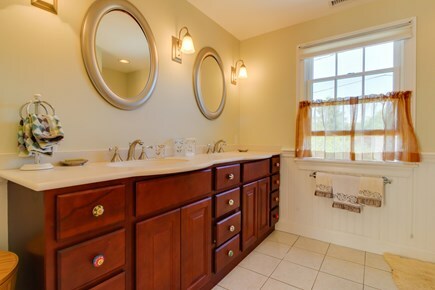 I found the house clean, comfortable, and private., with a great location to enjoy Edgar town. Although there were some maintenance issues, Vacasa responded within minutes of my call to address. 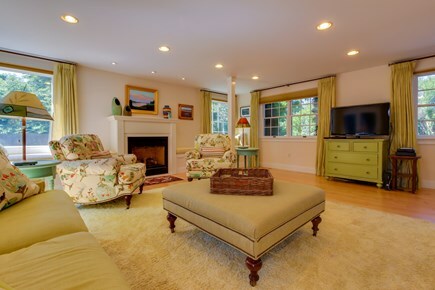 Quaint yet modern home in Edgartown that was a lovely and conveniently located getaway for 8 friends. Loved it! We rented this house for a long weekend for my father's 60th birthday and it was wonderful. We had 8 adults and one infant. Everyone slept comfortably and we very much enjoyed the large living room. Downtown Edgartown was a close walk and I can only imagine how wonderful the patio is to enjoy in warmer weather. Great stay! This property was amazing. We rented the house for a group of us to stay at during a wedding. I wish we had more time to enjoy the house, it was just spectacular..
Great house! We would definitely rent this house again. Walking distance to downtown Edgartown was really nice. The large living room, dining room and master suite were perfect for our family which included a baby, teenagers and adults.